The biggest Fourth of July celebration returns to the Inner Harbor! 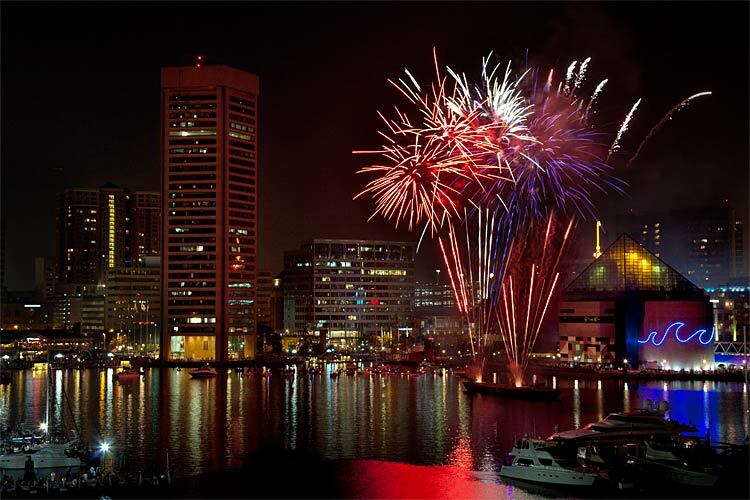 Baltimore’s Fourth of July celebration presented by Ports America will take place on Tuesday, July 4th from 7:00pm – 10:00pm in downtown Baltimore. At 7pm, everyone can enjoy live music from the Commodores U.S Navy Jazz Ensemble as they perform at the Inner Harbor Amphitheatre at Pratt and Light Streets. At 9:30pm, enjoy the best firework show produced by the fireworks company Pyrotecnico. The fireworks can be viewed by several locations, including Locust Point, Federal Hill, Canton, Fell’s Point, and Harbor East. Come join this patriotic salute to our nation with marching bands, fire engines, old and new cars, and service clubs from 6:30 pm – 8:00 pm. At 8pm the naval Academy Band will perform light classics, literature, and patriotic songs. At 9:15 pm Annapolis sets off its fireworks from a barge in Annapolis Harbor. The best viewing areas include, Northeast of the Severn River, City Dock, along Naval Academy Bridge, and any of the street-end park facing Spa Creek. The city will provide shuttle service from the Navy-Marine Corps Memorial Stadium (Gate 5) to Lawyers Mall from 5 pm to midnight. Come out and celebrate The 83rd Annual Dundalk 4th of July Parade at 8:15 am. The Parade theme is “Dundalk – Our Patriotic Town”. Enjoy marching bands, music, crafts, and more during the parade. At approximately 9:15 pm the firework show starts and will take place at the North Point Government Center. The fireworks can be seen in various locations throughout Dundalk, the best view will be centered around the North Point Government Center. Celebrate the independence of our beautiful country with three jam packed days of thrills, water park fun, exclusive ride times, and fireworks on July 2, 3, and 4. The park is open from 10:30 am – 9:00 pm along with the pool decks and midways remaining open from 7 pm – 9 pm for the patriotic celebration each night! Join us at Hurricane Harbor at 8:45 pm for the fireworks pre-show and then enjoy the best seats in the house as we light up the sky at 9:15 pm. Exclusive ride time and Coca-Colas 4th Fest Zone will be included with this event.